Portable Areas are looking better and better. This was a key missing piece. Thank you. But how do I put a master page in a portable area? As of yet, no one has come up with a solution that embeds the master page inside the portable area. The virtual path to the portable area currently must point to something that physically exists on disk which typically is in the host. I saw your new post about Master Pages (http://bit.ly/aWocy3) -- I'll add some thoughts there. I have another suggestion: We don't want ".Areas." in the middle of all our namespaces, so we're using ReSharper to set "Namespace Provider = false" on the Areas folder. We're also changing the portable area assembly namespace so that the area name does not repeat in the class namespaces. The portable area works fine like this, but the Embedded Resource Controller can't find anything. What I need is the ability to override the VirtualRoot and Namespace in the call to the AssemblyResourceStore ctor inside RegisterAreaEmbeddedResources. @Jeremy - Interesting. I'll have a look at it this weekend. Following are scenarios where things are working fine. 1. When I run the application on my local development server (Ctrl + F5). 2. When run application after publishing it on my localhost. 3. When I run the application on different development server (Ctrl + F5), say on my friend's box. I have tried all possible means to get it rendered in the situation it is failing but all in vain. I need some help and that is why I asked such a long question hoping that maybe I may get some pointer here. @packer - Hard to know without seeing all of the code. How are you referencing the images? absolute paths, etc.? Are you specifically getting 404 on the image requests? If so, what path is it showing for those? Fantastic blog. Just what I was looking for. I have it working with MVC3.. Note for any one doing so.. Thanks for the great article. I'm using this technique to great success, except in the case of static HTML files. I'm thinking this could have something to do with the HTML files not being complete (i.e. 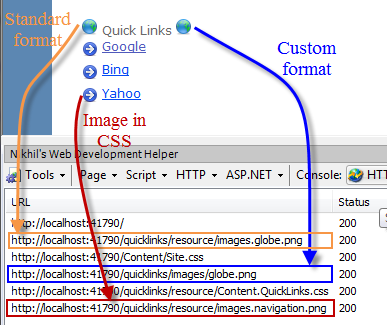 no <html>, <head> or <body> tags). @FunkMonkey33 - hmm, hard to know without looking at it. Are you able to get any more detailed information on the 500? I doubt it's because lack of <html> tags. Are you able to hit the URL directly from the browser? It turns out it has nothing to do with the html files being partial (starting with a Div tag, rather than with an html tag). It turns out it is something within the Embedded Resource Controller. I requested the same static HTML file (action set to Embedded Resource), directly from the browser url, and I get the same error message whether it's a partial html file, or a fully-formed html file. Okay, I found the problem by removing the DLL reference to MvcContrib, and instead downloading the source code, and adding a project reference to MvcContrib instead. When the 500 happened, I was able to break and see the problem. Basically the EmbeddedResourceController's InitializeMimeTypes did not include a MIME type for html. I added an html mime type to the dictionary, and now it works. How might I go about requesting this change to the main branch? Any issues consuming an MVC3 Portable Area from an MVC 4 application? I'm trying to do that and my PortableAreaRegistration's RegisterArea method never gets called. It seems that in an MVC4 application, the AreaRegistration.RegisterAllAreas() method in Application_Start (in global.asax.cs) doesn't wind up calling the RegisterArea() method of my PortableAreaRegistration class. Not sure why. I keep getting 404 errors on ANY embedded resources besides the views. Even in the Quicklinks area sample project! I was able to track it down to what appears to be IIS. 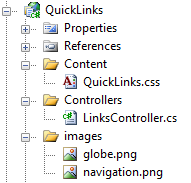 It seems that in the sample project, if the project's web settings are set to IIS Express, the images come up. In Local IIS they DON'T!